Want to know what your children are into right now? Get an honest insight into your kids' current interests, priorities and opinions without them feeling like they're being put on the spot. Living in London, we don't use our car for day-to-day journeys, so when we get in it to go somewhere out of town, it's always a bit of a novelty. For my children, I'm pleased to say, it's a well known and looked forward to chance for chat, music and games. A few days ago, when we were on a weekend car journey to visit family, I suggested we play a new game that I had just thought up and quickly decided to call 'My Top Three'. I find that a new game always has better status and chance of sticking if it arrives with a name, however hastily thought up. Then we went round and round the car, each choosing a different category like Top Three Cars, Top Three Days Out, Top Three Books, Top Three Smells, Top Three Toys, Top Three Things Daddy Does, and my son, somewhat out of the blue, suggested Top Three Plays by Shakespeare. Now, you will probably not be so interested in what all our answers were - but play this with your nearest and dearest and you'll definitely be intrigued. Their answers may surprise you, they may even delight you or move you, like my children's answers did me. But one thing's for sure - they will give you an up-to-the-minute insight into what your children are about right now. Try it, and see what's making your child's Top Three today. It's about now, in mid-January, when any New Year's resolutions we might have made to help us make a fresh start, or better ourselves in some way or other, begin to waver. Maybe you've had a glass or two of wine by now, or skipped that last gym session, or bitten your nails - and grrrr... you'd promised yourself you weren't gonna do that in 2015. It's about now that most of us really need a bit of help; to really turn those resolutions into routine; to stop those chances to change becoming discarded and forgotten like yesterday's socks. I recently read a fascinating article here, by Emily Temple for flavorwire.com, which shared 50 books to inspire and keep you on the straight and narrow with your New Year resolutions. The list featured a pretty eclectic selection of fiction and non-fiction books to encourage you to travel more, watch less TV, play a musical instrument, learn a new language - there was even a book to get you thinking about living your life in an arboreal kingdom amongst the treetops. But, for me, there was a category missing; for anyone who's made a parenting New Year resolution this year. You don't often hear about those, and yet I know that many mums and dads have made them. These are the parents who are trying their best but still want to improve the way their family functions. They might have made a resolution to feel more empowered as a parent and less like the maid, to be more in control more of the time, to be more present, to play more with their children, to improve their family's communication, to yell less, to get frustrated less - or they might - dare I say it - have even made themselves a promise to try to enjoy being a parent more. It is for those people, who have made, in my opinion, such noble New Year's resolutions - and who might by now be needing a source of inspiration - that I wish to add The Playful Parent; 7 ways to happier, calmer, more creative days with your under-fives to that list of books. 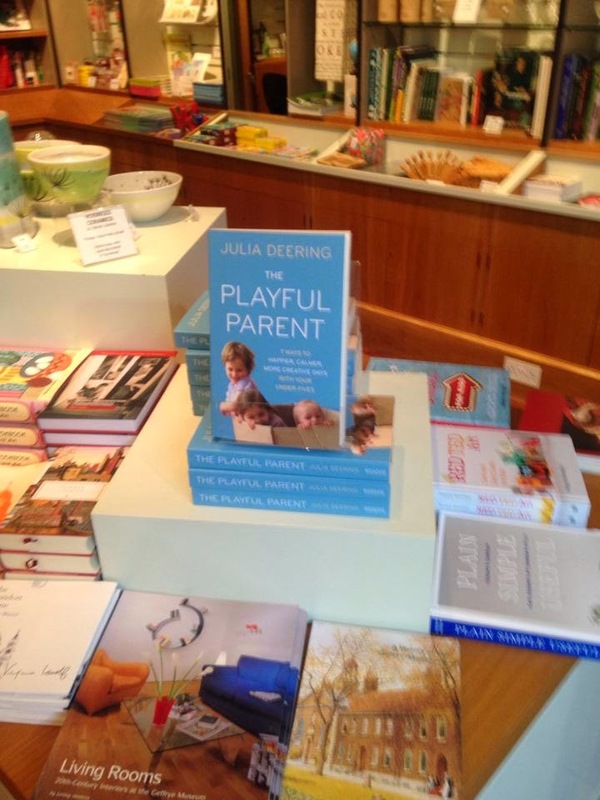 There is no better time than now to plunder its pages for practical, non-patronising and positive ideas to help make the parenting of young children more of a pleasure and less of a chore this coming year. 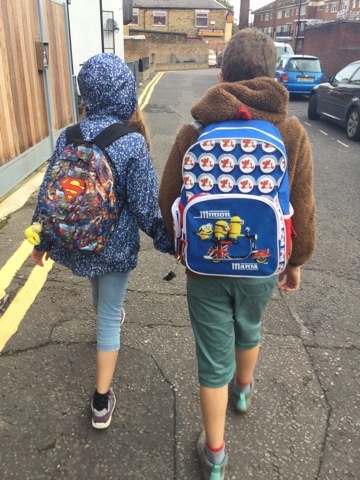 If you did make a parenting New Year resolution back on 1 Jan, I salute you, and wish you the very best of luck. Please keep me posted about how it's going - you can find me on Twitter here or on Facebook here. 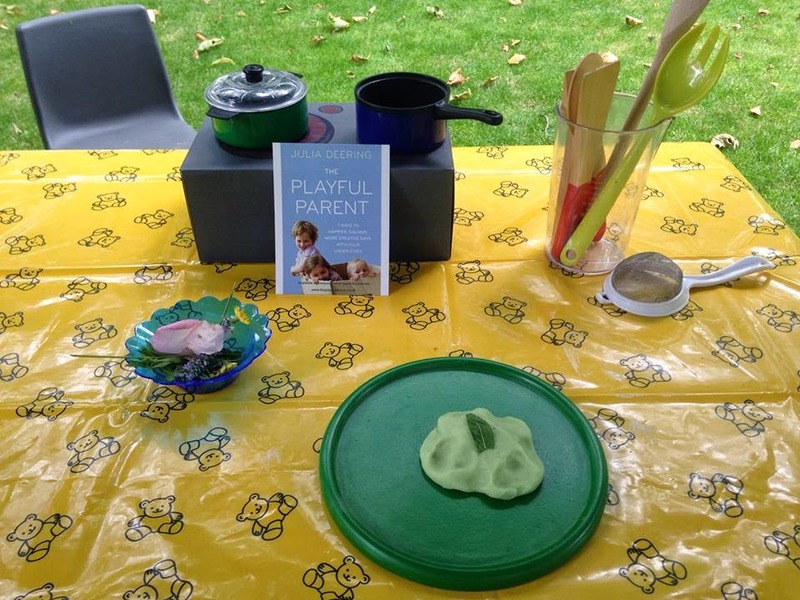 On Sunday I spent the day at the wonderful Geffrye Museum promoting my book The Playful Parent: 7 ways to happier, calmer, more creative days with your under-fives. The shop sold out of their stock - so I guess it went well! 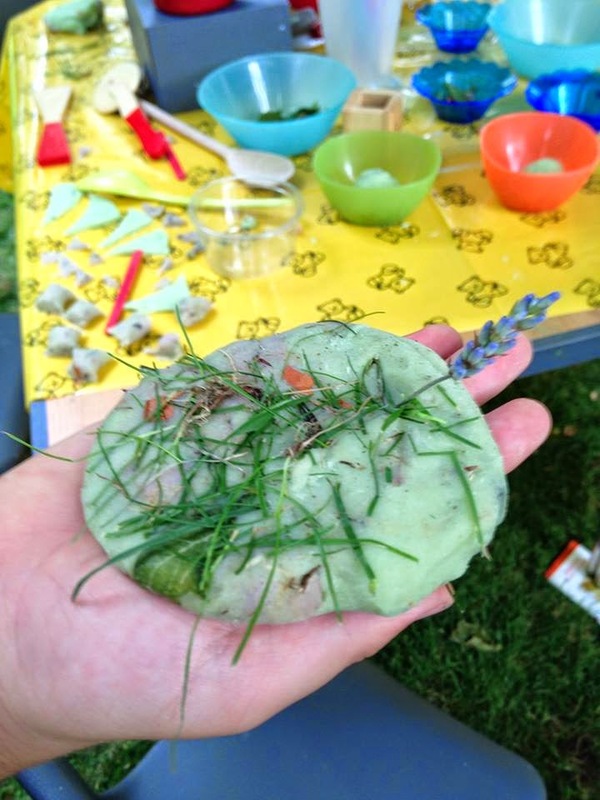 I set up an activity from the book, an invitation to play, where younger children could come and take part in some let's pretend cooking using home-made lavender or fresh mint play-dough, herbs, leaves and petals from the museum's gorgeous garden. 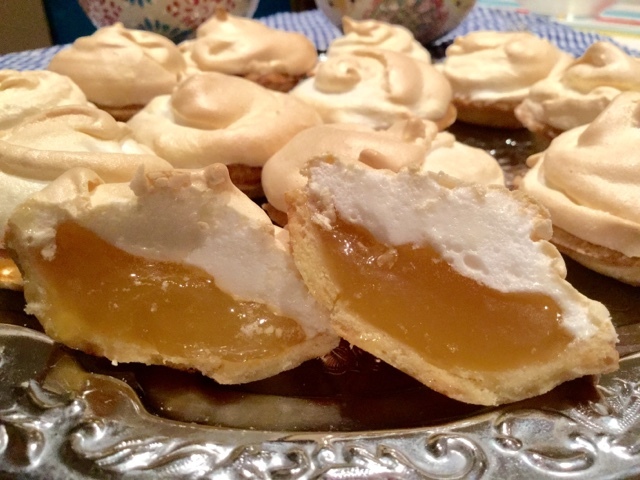 My daughter was a fantastic help, charming the little chefs in a way that no grown-up could. She chatted with them, and made them feel right at home in the little nature kitchen gazebo. 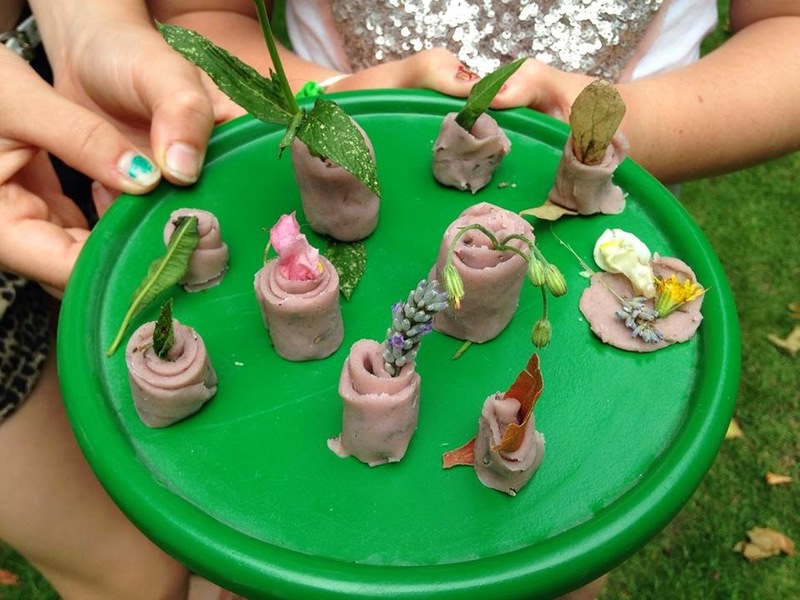 They rolled, stirred, tore, squished, cut, and smelled the dough, herbs and flowers and made some wonderful 'food', leaving their grown-ups relatively free to chat with me about the recipe for the play-dough (in the book) - and how these set-ups can work at home to develop young children's independence and help them find their playful flow. 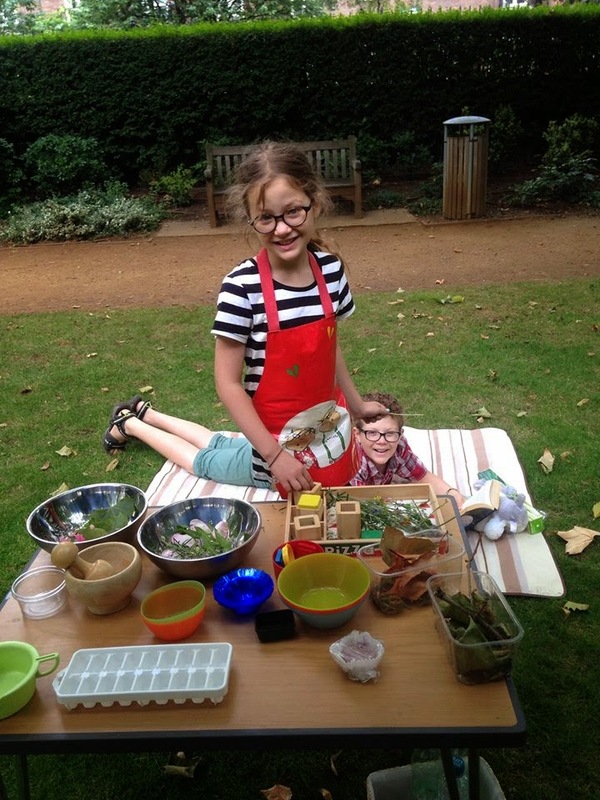 Some older children visited the stall too and, though the tables were a little small for them, they happily stayed and made some very photogenic food with the goodies - from posh canapes to nature pizza. It was great to meet so many lovely children and their grown-ups, and to have the opportunity to do my bit towards making the world of parenting a more playful place. Thanks to everybody who came to play! 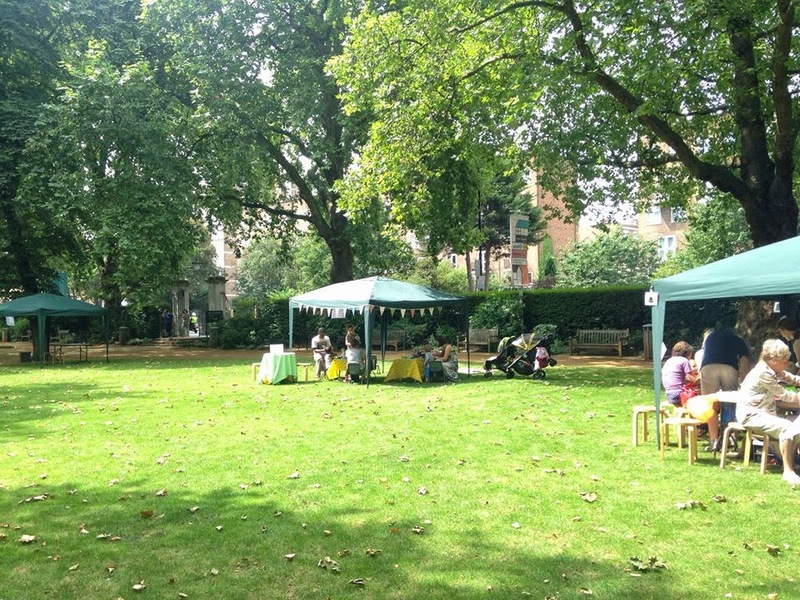 I'm delighted to have a stall at The Geffrye Museum's Family Day tomorrow. If you're in the area, do pop by, and say hi. 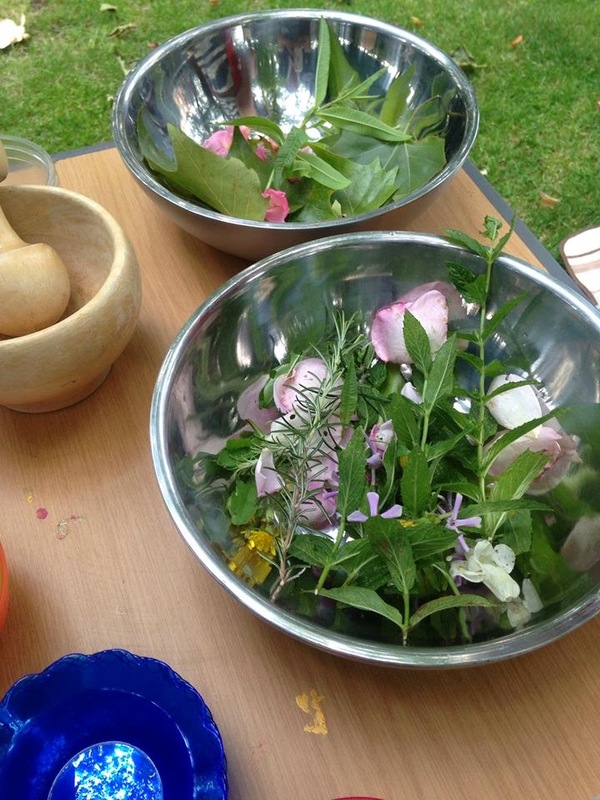 I'll be running a special nature kitchen especially for little chefs, and signing copies of The Playful Parent: 7 ways to happier, calmer, more creative days with your under-fives. A friend just posted this wonderful video on Facebook and I've watched it about ten times already. It may not exactly be a 'how-to' demo - but it is totally inspiring. Who wouldn't be tempted into making a miniature glamorous outfit or two after seeing such a beautiful film? HOW CAN WE RECREATE THIS OPPORTUNITY FOR OUR CHILDREN? I absolutely love these little mannequins from Harumika. They make dress-designing satisfyingly simple for the littlest of hands and the most creative of minds. This is due to the ingenious addition of a thin rubber-lined slit that runs down the back of each mannequin. Each kit comes with a little paddle that helps tuck in and secure materials into the slit, so there's no need for any cutting, pinning or stitching at all. Our local art, craft and fabric shop has a huge basket of handkerchief-sized (and smaller) off-cuts that cost between five and thirty pence. My children love rummaging through it and choosing a few pieces of material whenever we visit. Add to any fabric pieces you have, a few ribbons and sticky gems or sequins and that's really everything you'll need to get those couture creations off the ground. Arrange the fabrics, ribbons and any other little goodies you might have to hand on a clear and clean work surface along with a mini-mannequin or two, and let the making begin. If you lose your paddles, a lolly stick or the handle of a teaspoon work equally well. If your child is unsure about how to get started, try asking them to design something for themselves or someone they know well and suggest a few scenarios for which to design a costume. Perhaps they could make a dress for a wedding party, a special lunch, a red carpet event, a garden party, a book launch, a Halloween party, a winter ball, a job interview, a rock festival or a birthday bash, for example. Once an outfit has been made, your child will probably want to make another straight away - it is quite addictive. Be sure to take a photo (or even a little video) showing the outfit from a few angles before it's disassembled. This way there'll be a record of its unique design and if they want to make it again in the future the photograph can be used to jog their memory. Enjoy the video and why not have a go at making some mini-couture outfits with your little ones. If Dior can do it, so can our kids, right? Here are some of my children's couture creations made with our Harumika mannequins. The Playful Parent promo premiere! 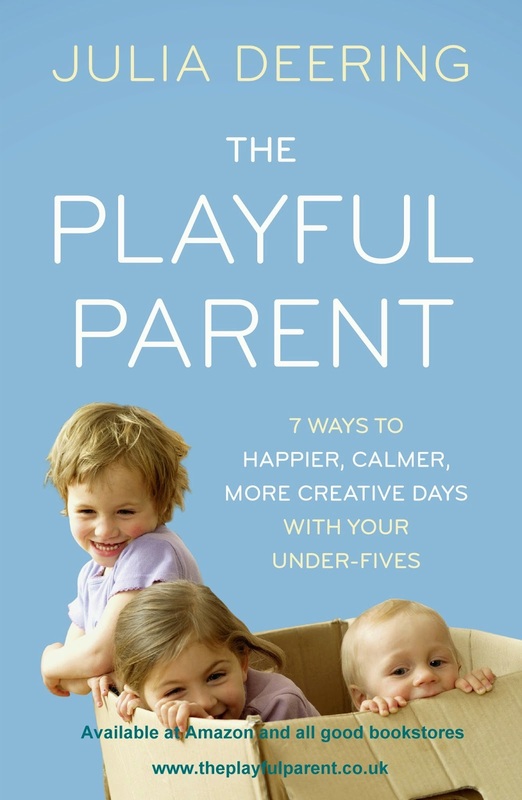 Want to know more about my book The Playful Parent: 7 ways to happier, calmer, more creative days with your under-fives? Well here to tell you, as well as a rather nervous me, is my very confident daughter Daisy! She knows ALL about it. This promotional video was filmed and edited by Paul Roscouet, and the music is by my husband Rob Deering - with vocals from our son Buddy!